Games which involve timing and speed are always electrifying and like to be played again and again. Today the game we are reviewing is totally based upon your timing and speed it will test your agility of brain and vision. Fruit Ninja is an astonishing IPhone game which is also available on other smartphone platform such as Android. In the game the fruits will be appearing on the screen from bottom to up and again going down, you have to slash all that before it disappears from your screen. 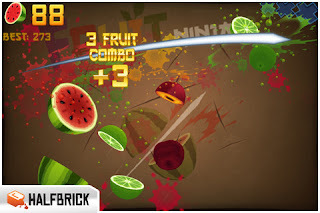 Once about 30 pieces of fruits has been slashed then the difficulty goes higher , now with the fruit bombs will also start appearing and you have to cut the fruits without touching the bombs as you touches the bomb the game will be over. Be careful with these bombs this will continue till you slashed about 250 pieces of fruits And also if you miss three pieces of fruits they will over although if you have cut down an enough amount of fruits than you can get an extra life which is always helpful in these situations. Game Fruit Ninja is divided into two modes the classic mode where you have to excuse bombs and slash down as many fruits you can the other mode is Zen mode which is basically a time attack mode where you have to slash down as many fruits you can with in some specified time. Remembers Zen mode gives you no life you can miss fruits in this and there are no bombs too. The game has got the leader boards of your scores so that all over the internet can see and compete against that score because you get listed on the basis of your scores. The controls in this game are very much interactive, you can easily cut down three fruits in a row by moving your finger as you are writing the letter z. 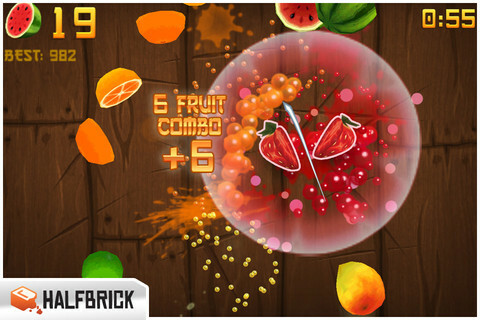 You can even use your both fingers to cut fruits game has the ability to recognize both of your fingers. Graphics of the game are marvelous. The slashes start from the main menu where you have to select the modes and other options by slashing the fruit . The game involves high quality textures and brilliant effects. New cutting blades and backgrounds have been included and new challenges. Rainbow Blade>>A charmed blade that glitters and sparkles with each slice. Water Blade>> Blank your mind. Be shapeless such as water. 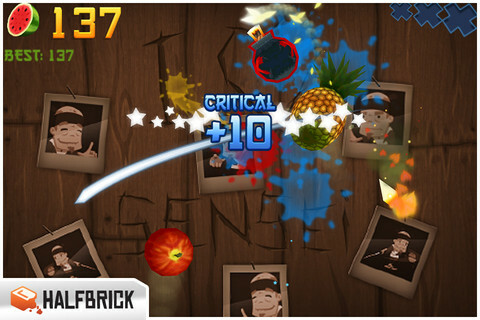 King Dragon Blade>>Attach the enormous power of the dragon and carry blistering demolition to all fruit in your route. Gutsu & Truffles Background>> Let welcoming faces monitor you on your drive to convert into an ultimate Fruit Ninja. King Dragon Background >> A background suitable for a king. Devoted to the incredible fruit master. Must play this game if you have an iPhone or even an Android based Phone because it’s also available on that, an enjoyable game that makes you addicted towards the game.